Defining the word “Depth” in a photo was the Weekly Photo Challenge today. I’m glad this theme came up, because I’ve enjoyed visiting several aquariums in the past year but never really worked with the images. At the time, I had fun playing with my camera and the inhabitants, tackling the challenging lighting and surprising quickness of the fish as they darted around their tanks. There were a lot of deletes! I chose to edit this one because of the interesting characteristics of the fish and because I caught it in a dive, adding to the feeling of depth. 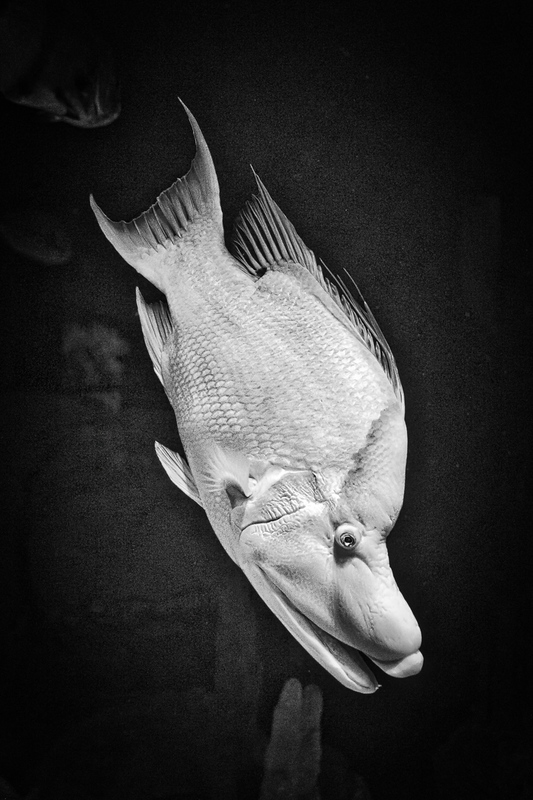 The fish is an iridescent white, but the reflections on the tank glass created a distracting greenish tint on the underside, so I used Macphun Tonality Pro to create a black-and-white version. This image may not have stretched my creativity all that much–and I enjoyed seeing the variety of subjects showcased in this week’s Photo Challenge Gallery— but it provided me with a great excuse to revisit some photos deeply buried in my archives! Excellent photo. I enjoyed that. I don’t know what kind of fish that is but all I keep thinking while looking is, ‘Mouth breather’. I find its face has a human quality…Slightly concerning since I’m craving sushi big time.